How to Add Style to Real Estate with Concrete Retaining Walls? What are retaining walls? If you are unaware then you should know that these walls are designed to hold or secure soil on a slope or at a higher elevation. Without retaining walls, this soil is loose and has the tendency to fall over, causing damage to your property. In real estate, retaining walls are usually created to restrain the pressures created by any natural sloping earth surface, like holding back earth when a building wall is constructed to install a basement. If you are using some old concrete walls in your house then you can find some damages and moistures effects on these walls. In this regards, you can do some concrete retaining work on these walls and you need to contact with some reputed concrete to do this task. Irrespective of its normal function, today retaining walls have become an object of interest for adding decor to real estate as well. You can utilize these walls to create beautiful outdoor living spaces and incorporate multi-use spaces. This is a modular design by which the corners of the block jut out, creating a 3-dimensional texture on the wall. The blocks of this wall are designed in such a way that the corners have a uniform texture. This makes them look decorative. This style is best suited for tight spaces, where circular retaining walls or tricky corners are necessary. This design makes use of weathered or tumbled blocks or ashlars. Using this design, different sized blocks are used to create a visually pleasing look. This design by when thinner and thicker slabs of the same block are used interchangeably. Lay out the blocks prior to installation to see how well they look as a whole. 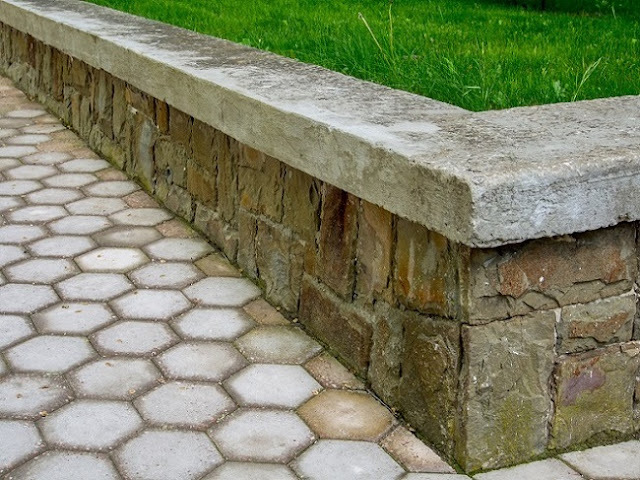 These blocks create a modern and clean look to your retaining walls. They provide more texture than poured concrete. Aggregate concrete blocks can be made to look more stylish and sleek if a more organic color is added on the blocks. Segmental retaining walls are designed from modular concrete blocks that are stacked over each other. These blocks are large and very heavy. These blocks are ideal for stopping soil and holding a slope vertical. Wood looking concrete gives you the texture of wood and the durability of concrete. These concrete slabs reflect the texture of wood due to the molding process and create a unique blend of industrial and organic, which is a point of interest for any garden. You can do this concrete retaining on your garden walls and you can make some garden fencing with these concrete retaining materials. These are one of the most popular materials for making retaining walls. They are cost-effective, stylish, and can withstand a large amount of weight. This is one of the most natural looking retaining walls you can see in a garden. These walls have fine grains and textures to make your wall look stylish. Other than that, hardwoods are durable and can stand the test of time with proper treatment and preparation. Retaining walls are required where it is necessary to have an abrupt change in ground levels. Retaining walls have their stability decided by the weight of the materials that make up the wall, especially if they are of stone or brick. It is best if retaining walls are given a foundation that is below the frost line and can be of concrete or any other layer that gives it a horizontal base.